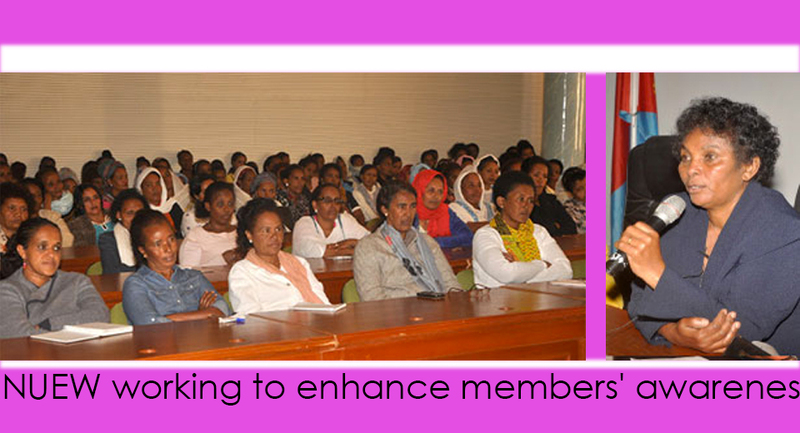 In a seminar conducted for heads of branches and sub branches as well as board members of ministries and corporations, president of NUEW, Ms. Tekea Tesfamicael stated that the union is working to reinforce conscious and increased participation of members in the national development drives. At the seminar held on 9 November here in the capital, Ms. Tekea noting that the history of Eritrean woman is making contributions in all national programs, called for the sustainability of these values nurtured during the armed struggle for independence and transfer them to the new generation. Indicating that the Eritrean Women ensured its equal rights through participation and sacrifice called on the new generation women to inherit the sublime value of equal participation and work for better achievement. Stating preservation and reinforcement of national and societal values is number one responsibility of females, Ms. Tekea reminded all ministries to introduce and create a forum for transferring the values to the youth and also a discussion forum on the issues of women. Finally, participants stating that the significance of the seminar in enhancing their awareness expressed readiness to successfully implement programs the union charts out.